Philips Electronics stepped up its cost-cutting drive on Tuesday and said more jobs would go as part of a drastic overhaul of its business, which began to turn around in the first half after losing 1.3 billion euros ($1.66 billion) in 2011. Ahead of an investor event in London, chief executive Frans van Houten said another 2,200 jobs would be cut, but the Dutch company wouldn't say how many would be from the Netherlands, which holds a national election on Wednesday where job losses are among the main campaign issues. Philips, maker of consumer electronics, medical equipment, and lighting systems, announced the first round of 4,500 job cuts in October, 1,200 of them on home turf. At the end of the second quarter Philips had 121,801 employees worldwide, 14,000 of them in the Netherlands. Van Houten raised the Dutch company's cost-cutting target to 1.1 billion euros ($1.41 billion) from 800 million euros, as it takes an axe to overheads, which were around 5 billion euros last year on revenue of 22.6 billion, by removing duplication and reducing complexity in areas such as IT. An analyst who asked not to be named said he understood Philips had around 70 different IT platforms and Van Houten wanted to cut that to six. Philips has said it wants to reinvest some of the savings into innovation, research and sales as it aims to get new products into local markets faster. "The identified additional overhead cost reduction measures will help us mitigate the effects of macro-economic headwinds and changes in pension-cost accounting, while making us a more agile innovation company serving our customers effectively across the world," said chief executive Frans van Houten. Europe's largest consumer electronics producer, the world's biggest lighting maker and a top-three maker of hospital equipment reported bumper second-quarter earnings in July, giving investors hope that the overhaul was starting to pay off. In his first year at the top, Van Houten started to reshape the company where he had spent most of his working life, including its corporate culture - largely considered consensus-driven and cautious - which he says isn't entrepreneurial enough. In his first year as CEO, he issued two profit warnings, reset financial targets, cut thousands of jobs, replaced his entire top executive team and, eventually, hived off the loss-making TV business. After two quarters of better-than-expected results, Van Houten told Reuters in July that the firm was now in "sustainable recovery mode", though he wouldn't rule out taking further measures to cut costs. "It does not only further increase confidence in the group's margin targets for 2013 but also supports projections that Philips will be able to achieve additional margin improvement in 2014," said Victor Bareno, SNS Securities analyst. "At the same time, we believe the restructuring story is already for a large part in the price at the current levels." 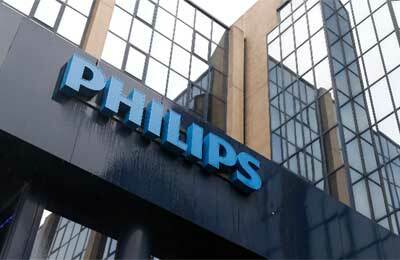 At 0959 GMT Philips shares were down 0.45 per cent at 18.945 euros, in line with the local AEX index. Like many other electronic firms looking to cut overhead costs, Japan's Sharp also said on Tuesday it would trim fixed costs by cutting salaries.